I have been really consumed with getting settled and adjusted here in Sydney, Australia. Man, I must admit, there have been ups and there have been downs. I knew this would be the case before I ever left the States. I think there is something in me that craves this sort of “being kicked out of the nest” feeling, where all comforts we once had are removed. It has really challenged me to put my beliefs to the test. I have been confronted with all my deepest fears and insecurities, and although some days are almost paralyzing, at the same time, I am working THROUGH these core beliefs and feelings. When we work through our fears, we gain more strength, courage, and trust in ourselves and in the greater plan unfolding in our lives. This is just the way I choose to live, and there is nothing wrong with choosing not to work through your fears. Coming to a new country has pretty much removed everything physical from my life, that I never even knew defined me as much as they did…until they were gone. I gave up my car, my house, my furniture, my job, my some of my clients, and the comfort zones I had such as Whole Foods, and my local cafe’s and gyms. I did this for the sake of experiencing a greater sense of myself, and to discover even more of my purpose. By getting lost, once again, in the deep-sea of fears and insecurities that were lying dormant within me, I am embracing the journey towards finding a greater sense of who and what I am, and what my life is really about. I am learning that humility is one of the greatest things to embrace in life, and that staying humble will empower me to allow and receive new ideas that my pride may have blocked from me. I am also really having to implement this idea of surrendering “my plan” to a power greater than myself, and trusting that if I let go of what “I” want, I will actually give myself a greater chance and opportunity to discover what I didn’t even know I wanted. This opens the door for possibility beyond my imagination. Trust has been another great teacher of mine thus far, because I became aware of how much I doubted and lacked faith that if I really let go of my ideas for my life, that it would make way for the real me to emerge. I am still practicing this and learning from this on a daily basis, and it isn’t always easy. At the end of the day, I am happy. I may be scared, confused, sitting in the vast unknown, and feeling utterly undefined, but I am happy. I know that these are the very feelings and experiences that have the power to transform me, as I commit to the willingness to keep trudging my way through them. “We must lose ourselves, to find ourselves.” Today I may feel lost, but I also know I have gotten lost on purpose…for the sake of being found. I want to share with you, a huge accomplishment for me. 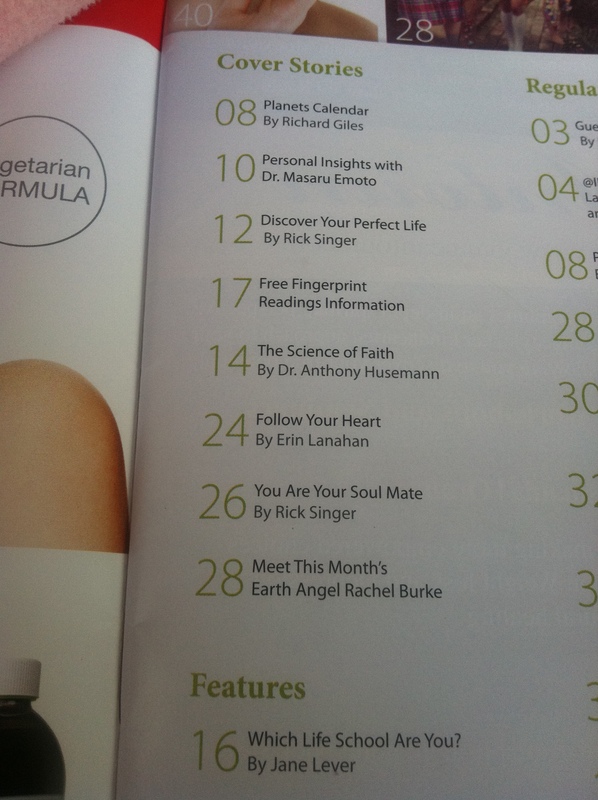 I was recently published in INSIGHT Magazine, Australia’s #1 Empowering Lifestyle Magazine. It is such an honor to watch all my efforts to follow my heart, although not always easy, manifest into physical proof that following my heart is the right thing to do for me. Funnily enough, that is the name of the article INSIGHT published of mine. I just want to thank all of you, for traveling along with me, and for sharing your ups and downs with me as well. It is an honor and a pleasure to connect with you here. Please leave any questions and comments you have for me, just below this post:) You can also share this via Facebook or Twitter, if you feel it may benefit anyone you know. 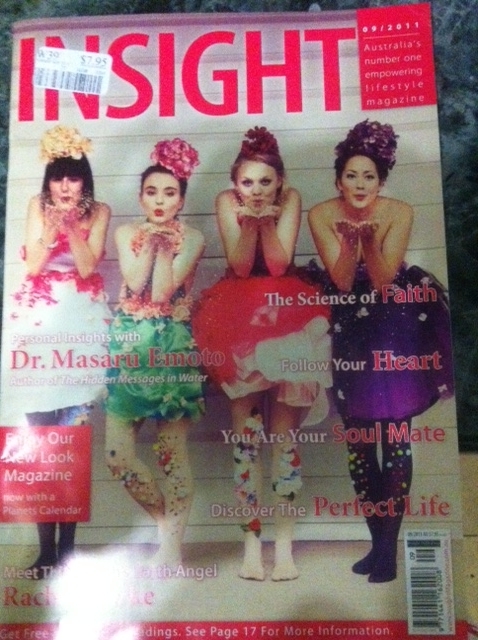 You can also see more of INSIGHT Magazine, Septemeber Issue, byt picking it up at your local news stand, or visiting www.Insightmagazine.com.au.